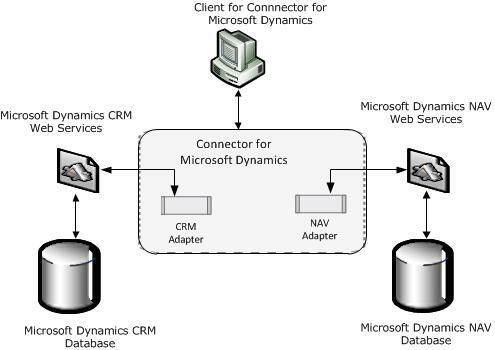 If you have a customer relationship solution that is based on Microsoft Dynamics CRM, then you can integrate it with Microsoft Dynamics NAV with the Connector for Microsoft Dynamics. The Connector enables simple integration and data synchronization between Microsoft Dynamics NAV 2009 R2 and Microsoft Dynamics CRM. It supports:. For each version, the On Premises and Online versions are supported. The following illustration provides an overview of the architecture. You use the Connector for Microsoft Dynamics to synchronize the types of data that are common to both customer relationship and ERP software, such as customer, contact, and sales order information. As you work with this data, you can keep the information in both systems up-to-date. For example, you can use the customer information that is in Microsoft Dynamics NAV to fill in an order form that a salesperson creates in Microsoft Dynamics CRM. Although integration is designed to work without customizations, for the best results, you must customize it to reflect your business and customer processes and needs.